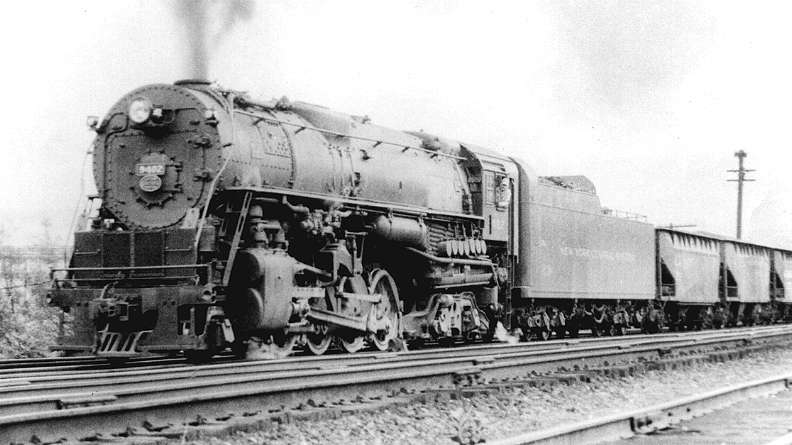 The Boston & Albany Railroad was the first railroad to test Lima's 2-8-4 "superpower" design and it was impressed enough to immediately order twenty-five of the new locomotives. The B&A was the first railroad to use the 2-8-4 and it gave this wheel arrangement its name "Berkshire" for the Berkshire Hills where it was tested. The first order was for twenty-five exact duplicates of the demonstrator that was used in the tests. This group arrived from the Lima Locomotive Works in 1926 and was designated Class A-1a and assigned road numbers 1400 through 1424. 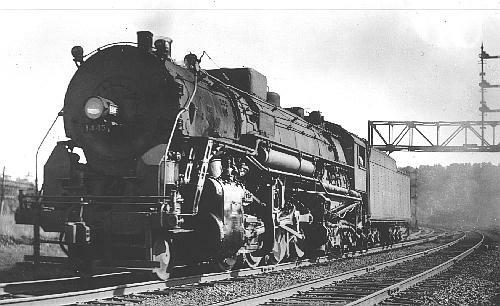 These first production "Berkshires" had 63" diameter drivers, 28" x 30" cylinders, a boiler pressure of 240 psi, they exerted 69,400 pounds of tractive effort and each weighed 389,000 pounds. Shortly after delivery of the first order, the B&A placed an order for twenty more "Berkshires" from Lima. This new order called for these locomotives to have larger sand capacity. The original design sand domes were to be built up and squared off to carry twice the sand. These twenty became Class A-1b and were given road numbers 1425 through 1444. The larger sand domes were needed to provide more sand for traction on the steep hills and later the "Berkshires" from the first order were modified with the squared off boxes. These locomotives were delivered in 1926 and 1927 and were similar to the class A-1a and each weighed 390,500 pounds. In 1930, the B&A took delivery of its third and last order of Lima built Berkshires. The order for ten was designated Class A-1c with road numbers 1445 through 1454 assigned. On the B&A these last ten "Berks" were dubbed "sport models" because of their cleaned up lines and 12- wheel tenders. The "sport models" locomotive had the same basic performance specifications as the earlier classes and they weighed 396,100 pounds. While all fifty-five of these A-1s were always Boston & Albany locomotives they did not spend their entire lives on the B&A. During World War II they were used on the New York Central (its owner) to help with the heavy war related traffic, and as diesels were delivered to the B&A, the Berkshires were transferred to other NYC system lines. There are no surviving B&A 2-8-4 "Berkshire" type locomotives. The Pittsburgh & Lake Erie Railroad had the distinction of receiving the last steam locomotive built by the American Locomotive Company. This locomotive was a "Berkshire" type that was delivered to the P&LE in June1948 and it was assigned road number 9406. The P&LE only bought seven "Berkshire" type locomotives. They were all built by ALCO in 1948 and were designated as Class A-2a and assigned road numbers 9400 through 9406. These 2-8-4s had 63" diameter drivers, 26" x 32" cylinders, a 230 psi boiler pressure, they exerted 67,100 pounds of tractive effort and each weighed 426,000 pounds. Delivered in May and June of 1948, this group had the shortest life span of any of the modern design steam locomotives. Numbers 9400 through 9406 were retired in August of 1956 and then scrapped in the early months of 1957. Boston & Albany A-1a 25 1400-1424 1926 Lima Numbers 1411 & 1423 scrapped in 1950. All the others scrapped in 1949. Boston & Albany A-1b 6 1425-1430 1926 Lima Numbers 1425-1430 scrapped in 1949. Boston & Albany A-1b 14 1431-1444 1927 Lima Number 1434 scrapped in 1950. All the others scrapped in 1949. Boston & Albany A-1c 10 1445-1454 1930 Lima Number 1448 scrapped in 1950. All the others scrapped in 1949. The NYC's last steam locomotives delivered and the last from Alco's Schenectady Works, these went to the Pittsburgh and Lake Erie. Richard Leonard noted that unlike most 2-8-4s, these engines had relatively small 63" drivers. They were retired in 1957. Data from table in Locomotive Cyclopedia of 1930. (Many thanks to Chris Hohl for his 22 September 2017 email reporting unlikely boiler pressure values for 177 entries. A Locobase macro caused the error .) Works numbers were 6979-7003 in February 1926 and after as well as 7192-7211 in December. Boiler had Elesco feedwater heater, valve motion had limited cutoff. Boston and Maine T-1 class (Locobase 47) and Illinois Central #7000 class (Locobase 48) were very similar and built at approximately the same time. Later A-1c (1445-54) -- see Locobase 3172 -- carried 78 2 1/4-in tubes, concealed Coffin feedwater heaters, and the firebox was fitted with 149 sq ft (13.85 sq m) of thermic syphons. Retired in 1949, after which 1423 and 1434 were sold in 1950 to the Tennessee, Alabama & Georgia as their 601-602. The TAG Line operated the pair for about two years before retiring them in October 1952. Data from NYC 1 - 1944 Locomotive Diagrams supplied in April 2005 by Allen Stanley from his extensive Rail Data Exchange. (Thanks to Chris Hohl for his 3 April 2015 email correcting the valve gear.) Works numbers were 7556-7565 in August 1930. This was the last batch of ten Berkshires built for the B&A. Compared to the A-1a/b of a few years earlier (Locobase 46), these had fewer 2 1/4" tubes (74 vs 90), concealed Coffin feedwater heaters vs Elescos, and the arch tubes in the firebox were removed in favor of another thermic syphon, which raised their total area to 149 sq ft (13.85 sq m). They still used 14" (356 mm) piston valves, which were actuated by Baker valve gear.